Part of Blueport Commerce’s comprehensive furniture ecommerce platform, Store-Sync is a patented technology bridging the “digital divide” between online and in-store shopping for big-ticket items. It’s a cloud-based shopping application that creates a seamless, personalized experience for shoppers—letting retailers leverage big data to sell furniture more effectively. 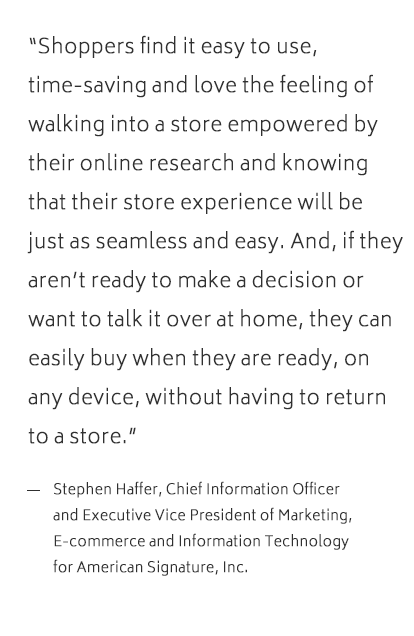 For shoppers, Store-Sync delivers a seamless path to purchase. Store-Sync makes it easier to shop for furniture across digital and traditional channels. No matter where shoppers begin – whether on their computer, tablet, smartphone or in a store – Store-Sync captures and synchronizes their preferences and the items they’re considering between all of their devices and the store’s point-of-sale system. With Store-Sync, customers can easily pick up where they left off at any point of their shopping journey. Favorite styles spotted online can be saved and sent over to the nearest store location to facilitate a fast and easy in-store viewing. 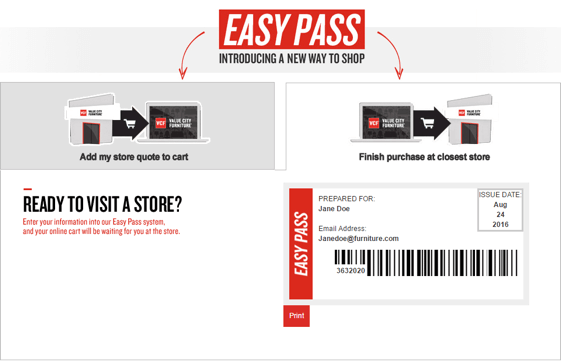 And it works in reverse—the styles the shopper likes in the store can be saved to Store-Sync to be viewed later online. As the shopper progresses towards their purchase, their shopping experience becomes increasingly personalized and they never have to have to start over. After they’ve shopped around or talked it over, they can buy anytime, from anywhere. For retailers, Store-Sync enables the unprecedented ability to track marketing and sales touch points across channels. Tracking provides critical analytics and behavioral insights that enhance customer engagement and improve marketing effectiveness. Additionally, Store-Sync assures that salespeople who contribute to a sale at any point in the shopping process are compensated accordingly, removing a key friction point in selling furniture online. By tracking—and properly compensating—salespeople involved in each closed sale, Store-Sync incentivizes employees to focus on being the helpful experts that retailers and shoppers rely on to complete big-ticket purchases.